Overlays play a very important role in heightening the elegance and sophistication of any events dcor. They add color, dimension, and texture to ordinary banquet tables, which is where your guests will spend a considerable part of the evening. 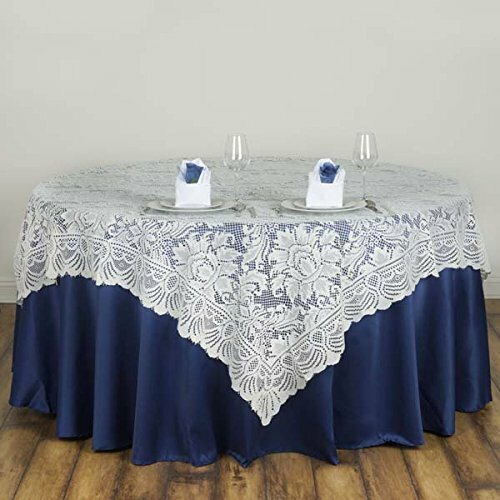 Our classical lace overlays bring that vintage touch to your table settings that many couples seek to achieve, with a homey feel and relaxed mood, your guests will surely have the best time celebrating your special day with you. The high quality lace has intricately been fashioned to give that sheer delicate-looking texture to the overlays that will exude oodles of elegance and imperial sophistication to your wedding dcor. Besides being a classy and swish choice for weddings and parties, these overlays fit perfectly to those jolly moments at home with friends that you rejoice while relishing your home baked delights and cherishing those heart to heart talks with your close ones! Additional Information: Material: Polyester Dimensions: Approx. 72" wide x 72" long Hand wash, hang dry only.